Long Lines, Packed Campsites And Busy Trails: Our Crowded National Parks Overcrowding is one of the biggest challenges facing the National Park Service, and as the agency prepares to turn 100, another record-breaking year is predicted. 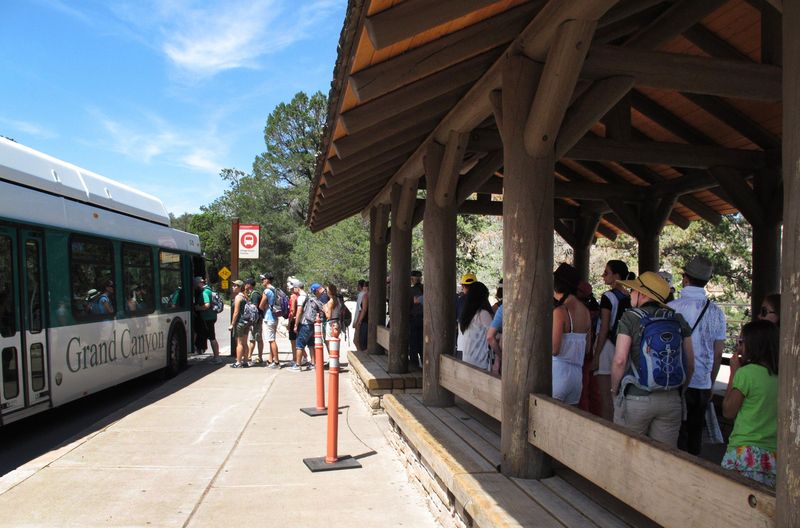 Tourists at Grand Canyon National Park in northern Arizona wait for a shuttle bus in 2015. For years, the Grand Canyon and other big national parks have been seeing rising attendance. The National Park Service wants you to get out into nature. But the success of campaigns like the National Park Service's Find Your Park and others from state tourism offices has created a huge demand. Last year, a record 305 million people visited national parks. As the Park Service likes to point out, that's more people than went to every single Disney park, NFL, NBA and MLB game and NASCAR race combined. Zion National Park — famous for its jaw-dropping, red sandstone cliffs and colorful panoramic views — recently had lines 300 deep just to get on a shuttle bus that goes from the park to the visitors center. 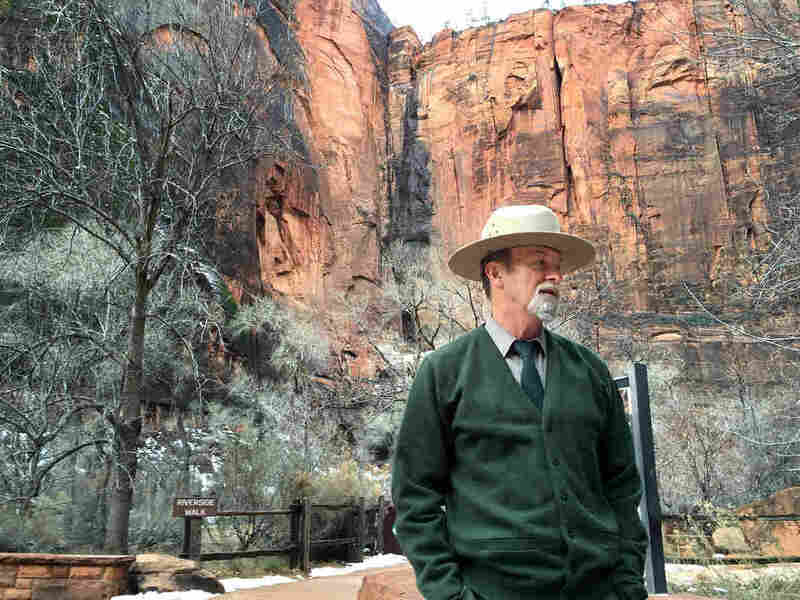 Last year, Zion in southern Utah set its own record. Nearly 4 million people squeezed into this 6-mile-long canyon, most coming between March and November. No, thanks, says Norma Dunton, who made a point to plan her recent trip for a weekday, in winter, when crowds tend to thin out. She is worried about the future of these protected places. "They have to save the parks. Our children need to have to have this connection with nature," Dunton says. Dunton has been coming to Zion to hike for 40 years, and every year she says the congestion gets worse. "As much as I don't like the idea of reservations to get into the parks, but, it would be worth it to save the parks if that's what they have to do," Dunton says. Pretty much every idea is on the table right now for some of the country's oldest and most popular parks like Zion: reservations, phased entries for cars, daily caps on visitors. Jack Burns is in charge of crowd management at Zion. He's standing at one of the worst pinch points in the canyon: the popular Temple of Sinawava. "Zion was never designed to see, literally, millions of people," Burns says. Jack Burns, chief of commercial partnerships and planning, stands at the Temple of Sinawava. About 15 years ago, traffic and air pollution got so bad here that the park banned cars at certain times. Now Zion's mandatory shuttle system is held up as an example of how parks can better manage crowds. But it is getting stretched to its limit. "We also realize that we are looking at a capacity issue here," Burns says. At extremely busy parks like this, managers are starting to talk about turning people away at the gates. This is where things get sticky. The mission of the Park Service is to keep these public lands open and accessible. More visitors getting out into nature is a good thing. But it's straining infrastructure. There's a nearly $12 billion backlog on maintenance. Search and rescue teams are understaffed. And the number of human-wildlife conflicts is on the rise. So are we loving our national parks to death? "We're running out of room for people to have these wonderful experiences, and the agency and the partners of the agency are going to have to do a great job of figuring this out and probably figuring it out pretty soon," says Joan Anzelmo, a retired park superintendent in Jackson, Wyo. She's now with the Coalition to Protect the National Parks. Anzelmo says we're getting used to having to make reservations for concerts or other popular activities, and we might need to start thinking that way for some of our most popular national parks. "If we want to have these places for another 100 years and beyond, you might not be able to do everything at the same time. There may need to be certain kinds of modest limits on what you can do or how you can access certain areas of a national park," she says. 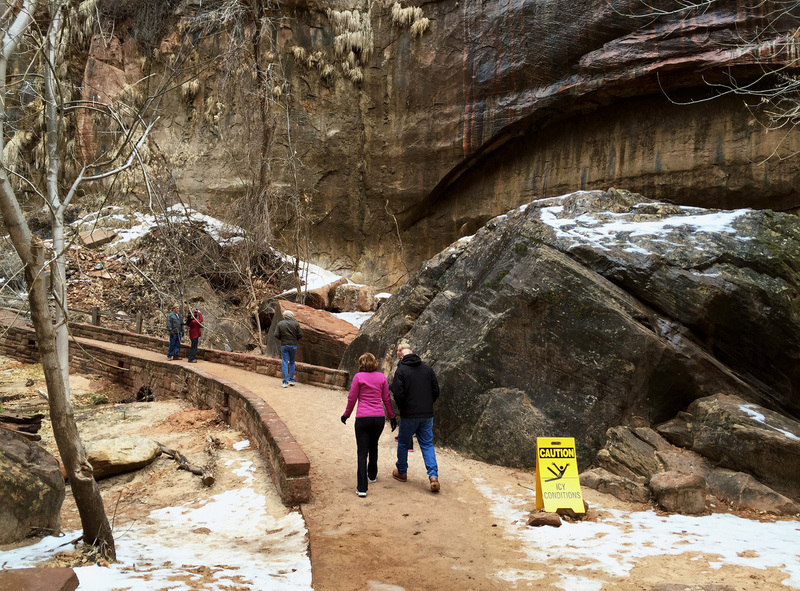 Hikers head up a trail in Zion National Park during the winter season, when crowds tend to thin out. For this, the Park Service's centennial year, one of its main strategies is to try to divert people to other, less visited parks. So instead of going to Zion, have you considered Capitol Reef next door or maybe the Great Basin in Nevada? Or if you do go to Zion, why not go now, beat the crowds? That was Chung Kim's plan. He's taking his parents who are visiting from Korea on a winter swing through the national parks of the Southwest. "We've been to Grand Canyon, Bryce Canyon, and this [Zion] is like, my third national park here. I like this national park the best," he says. In Korea's national parks, Kim says, people regularly line up just to get on a hiking trail. So to his parents, the gorgeous open valley where the Virgin River dumps out of a narrow slot canyon looks like pristine wilderness, Kim says. "Still less crowded than in Korea, so, they like it here," he says.